Is it possible to hold both long and short position in a particular cryptocurrency? For example, if I've some existing long position in ether, can i open new short position? Will doing this close my long position? Hi - unfortunately we don't have this on offer, but you should be able to set something up in excel using the following information. Yes it is possible to hold both a long and short position in a specific cryptocurrency. Lets use Ether as the example as you mention it. I can understand going long on one crypto and then shorting another crypto if you had studied price behaviour and noticed patterns forming. It would be an interesting pair trade. I can also understand that you could easily hedge a position on a crypto by taking the opposite position on another asset if there was an establish correlation. I struggle to understand the benefit or advantage of having both a long and short position on Ether in relation to profit maximisation on a trade. If the trade has gone against you then your stop loss should have kicked in and you are out. If you are having two opposite positions on Ether at the same time then your 'risk management' and strategy needs looking at in my opinion. Never trade against the trend. On balance of probabilities and odds you are more likely to lose on that trade than win. You can get lucky but out of say 100 trades you are more likely to lose than win on the majority of them if you traded and opened positions against the trend. Hi James thanks for pointing me to the relevant answers and for always helping us in the forum. It's stated "You can open a long and short position on the same market by making sure the ‘force open’ option is selected on your deal ticket". I can see the force open option on my new trade tab. However there's no such option on my new order tab. So how does it work if i want to put in a new order in the opposing direction? I certainly don't wish for my existing position to be closed if my new order is executed. Hi Trendfollower, thanks for your long answer. I've always enjoyed reading your detailed analysis and insights in your posts. I've some long position in ether which i opened at quite a low price which i intend to hold for long term. I observed although ether may be in a uptrend, there's always volatility in the market in which there may be time of price weakness. Hence i was thinking of opening short position in such times to gain some profit in the shorter term. I'm a new trader. Hope to hear your opinion on my thoughts and strategy. Thanks. So you have a long position in Ether which seems like an investment as you intend to hold it long term. However, if I understand you correctly you want to open a short position at the same time and trade Ether to make profits in the short term. I am not saying it cannot work, of course it can. It is not something I would consider. All I would advise is that you look to establish if when there is volatility, price corrections and drops in Ether is it generally in the broader Cryptocurrency market or specifically with Ether. Also I would look at which Crypto's that IG offers falls the most when such corrections occur. I am not advocating doing this trade but if you are seriously going to do this then there may be a better Crypto to short than Ether when prices are generally declining in the short term. For example at time of writing all the Crypto's that IG offer are 'red'. Ripple, Bitcoin Cash and Bitcoin Gold have all fallen in percentage terms more than Ether. Another factor that would be important for you is the level of 'leverage' you have on your long position on Ether and the level of 'leverage' you intend to use for your short position on Ether. Have a plan, know your exits on both trades, especially the new short that you are looking to open, use tight risk management controls as otherwise it could get messy! 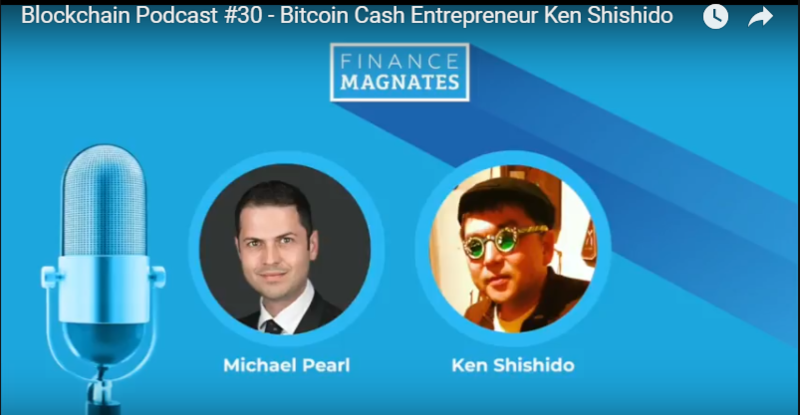 Podcast with Bitcoin Cash entrepreneur Ken Shishido. Discusses bitcoin and compares with bitcoin cash and the differences in, and problems with the blockchain transactions. Also makes comparisons with other crypto currencies and possibilities for the future. If you like crypto and ether then you'll probably be interested in this quote from Vitalik. Be careful if you are going short whilst also going long. If you open a short position and the market becomes unlongable then you will not be able to close the short as closing it means to go long. You may be stuck in a short position and give back all your profits. Personally I sold all my ethereum long positions end of last week. Brazil, Korea were all talking about banning cryptocurrency exchange. If this is happening then generally people will be profit taking or selling ethereum. A better strategy could be if you are thinking long term that the price will rise then wait for the correction and add to your position at support when the trend is reversing back up. 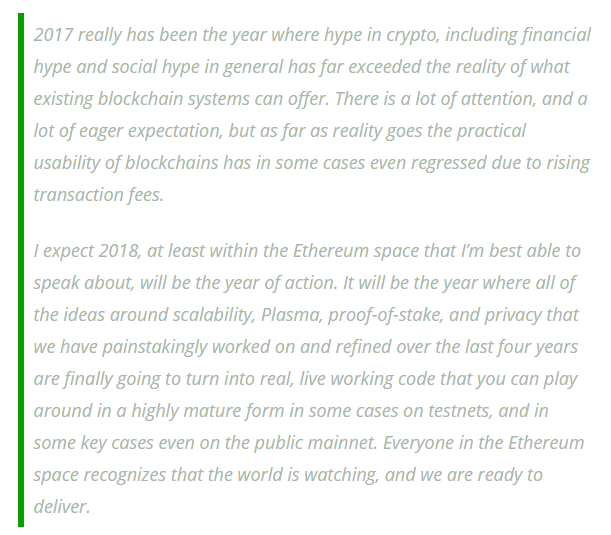 I think 2018 will the the year for Ether. I also anticipate a good year for Ripple, Stellar and IOTA. I have only just seen ethers chart. To add to my earlier comment I would be weary about keeping hold of long positions unless they were bought very early on. And now ether has become unborrowable so you can not short the market. Likely because everyone is shorting and therefore ig has reached its risk limit. There is a chance price can keep dropping so you could be giving profits away and if you are stopped out then out with breakeven. Remember if people bought ether at lower prices away and price drops they'll sell or hold. Its unlikely that the majority will buy more especially while waiting for korea stance on cryptocurrency. Thanks Situation for your analysis. Yup I'm holding some ether position which i bought earlier on. It's a pain to see the unrealised profit eroding away while the market correct but I'm still holding on to them as i believe in the long term uptrend. The sell off earlier on in the Asia morning was scary but luckily the bounce up was quick too. Hopefully it'll be generally up from now on, at least in the short term. I was considering to open short position when it reached the peak of about 1400 a few days ago which i felt was too overbought, hence i asked the question of holding both long and short position in this forum. Thanks all for your wonderful analysis and suggestion. It has been useful to build up my trading knowledge. Its going to difficult to call the direction now. There was a lot of buying from 7 to $800 so will have to see what those people do. Will they hold or will they sell. Shorting this market was a good idea and probably still is but you don't want to get caught out in a period of being unlongable. If we didn't have that problem I would be short myself. Ps. All the comments are just people's views or opinions but remember that is what the market is- just a collection if views. So the more of us who get involved in commenting in this community the more opinions we'll get and ultimately learn more. Hi I am pretty sure has said that you will always be able to exit a position, it is the opening of new positions that could be a problem depending on the level of IG's exposure. Can't find the thread, maybe James can confirm. I had to call ig at that time. You can close it if that is the only position you have but if you are already long then you cant close it as you would be overall more long (buy to close the sell). Maybe you could use a stop loss.... but they are far from the market price so you'll give a lot of profit back anyway. Hi - let me also clarify a few things which relate to trading and exposure, and using the force open functionality on a deal ticket. Put simply, there is no financial benefit from having a long and a short in the same market at the same time, and if held overnight it will actually be more costly as you would be paying 2x the cost of overnight funding. If you have a long and a short your exposure is zero. You are basically trading exactly the same (and will have the same financial benefit) of someone who doesn't have a trade on at all. When you have a long and a short, and you are looking to close the short side, your net effect is to increase your long exposure, which will be rejected basis the 'unlongable' status. I hope this clarifies my earlier statement, but any questions just ask. I have no agenda, apart from being pestered by a nagging desire, to write at least one piece of analysis on Bitcoin (BTC). As an FCA regulated firm, we are currently contemplating adding this to our extensive list of products but the jury is still out! This analysis is based on technical analysis and is my view only. I have never owned Bitcoin and have been naturally green-eyed in the mind-blowing rally that has taken place in this asset over the recent months! So, I have nothing to gain this morning in producing this piece apart from, hopefully, utilizing my expertise in analysis, trading and writing trade ideas, in the hope that someone (or many) may benefit from my knowledge & wisdom and ultimately…come back for more!! What do I know about Bitcoin? VERY LITTLE! What do I know about writing trade ideas? PLENTY! Do I need to know anything about Bitcoin to write this trade idea? Not really, it’s all about technical analysis on the historic price chart – I’m not analysing the fundamentals. That’s another story and way more boring than this!! Warning – there may be some trading/market psychology thrown into the mix but I will not dwell on it too long! Before I start – 2 charts below with time-frame and price removed – look familiar? Chart 1 is a weekly chart of BTC over the last 2 years and chart 2 is monthly chart of Gold (XAUUSD) over the last 2 decades! Interesting!? Price action topped out close to 20,000 and is currently in a corrective formation lower and trading near the psychological 10,000 level (over 50% retracement since inception. A clear break of this level should lead to a more aggressive leg lower, in a typical AB=CD correction towards 8,000 towards the 61.8% Fibonacci retracement level. This is the first time, since 15/09/2017, that prices have broken below the Ichimoku cloud. Two scenarios to contemplate – one for the bulls and one for the bears! I hope you have enjoyed my brief analysis. 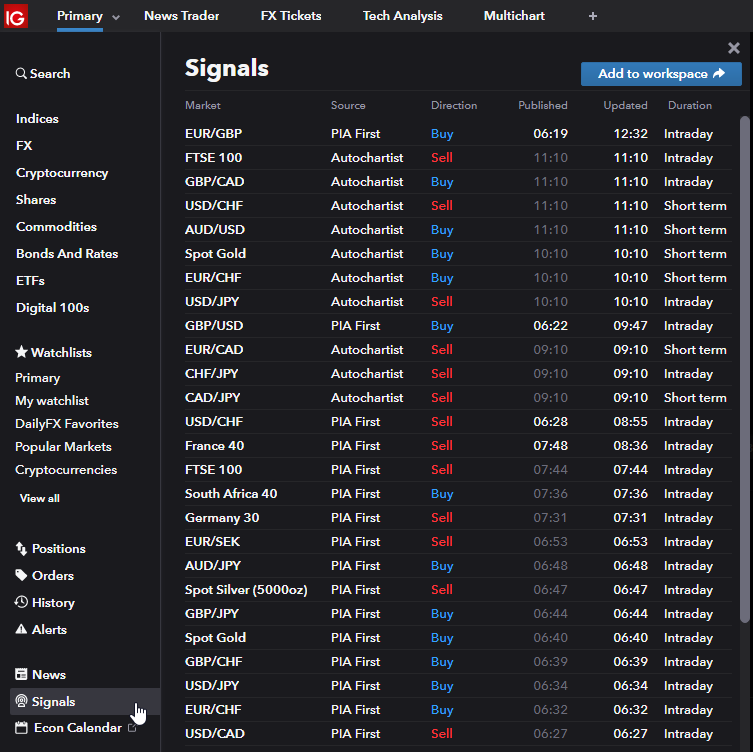 If you are interested in trade ideas on FX, Equity Indices, Commodities & Single Stocks you can use the PIA First signals via IG's signal center as shown below. PIA-First Limited is authorised and regulated by the Financial Conduct Authority, which can be checked here. FRN 787261. I like this, PIA First (one of the signals companies used by IG) posting some technical analysis on the forum for us, interesting stuff, hope to see more. Sure hope oilpro doesn't see it or he will just start trolling them. I dont know about the above analysis. you buy at 8500 with stop at 4500 then risk reward is 1:1 which I would not advise any trader to take. I'm not a big fan of buying dips in a massive sell off like now. They can call it a correction but people are taking profits, selling and not re investing at present. At this stage the driving force has to be good fundamental news. Waiting in the sidelines until you can see buyers come in might be more helpful. Thankfully i know a lot about analysis and more about trade ideas! I hope that better explains the idea. Thank you for the critique, it is always much appreciated. The risk reward ratio is an always an interesting topic and to look at it from a different perspective buying a dip of around 50% of the main move the first target for me is always the prior high (or First Trouble Area) which is just 1:1. Because although you hope price will punch straight through and carry on with trend to a second target you must be prepared for the possibility the previous high is at a level of strong resistance enough to halt the trend. If the trend is strong you will often see a concerted effort to push hard through any obvious resistance levels on the chart but price trepidation at these levels indicates lack of faith and the real possibility your entry will be the next level to be tested. I just needed to remind community members of IG's official stance on this. In regards to the PIA analysis, no representation or warranty is given as to the accuracy or completeness of this information. Consequently any person acting on it does so entirely at their own risk. IG accepts no responsibility for any use that may be made of these comments and for any consequences that result. And now may the thread continue. I would just like to thank James for his quick response to this specific matter. Can't deny there was clear declaration attached to these posts. But to have professional technical analysis (not automatically a traders analysis) posted on the forum is a bonus, these guy have been on continuous professional development courses costing amounts we would struggle to imagine and that we certainly have never experienced. This is high quality stuff but never meant to be the sole last word but given freely to incorporate as seen fit into your own analysis. However, you have to remember that people all over the world can view our posts on the IG Community. Some of them will have very little experience in trading which is why some of the posts I am reading can be extremely dangerous. Not necessarily PIA but there are many other posters that could cause more harm than good to new traders with little experience. I think some of the more experienced investors and traders have a moral obligation and responsibility to ensure that the content they post is of high quality and make it clear that it is their personal views and opinions. Also any links they post of articles from the media are indeed actual reported news which can be seen in different publications. I am not a big fan of posting charts though I do use them as different readers can interpret different things from them unless they are explained. There are far too many charts posted without the correct analysis. I would rather post high quality analysis and let the reader look at the charts for themselves. You point is valid though. Yes, thank god the stuff posted is professional, imagine if this was a public forum like 'Trade2Win' where anyone could post any old garbage. oh wait. 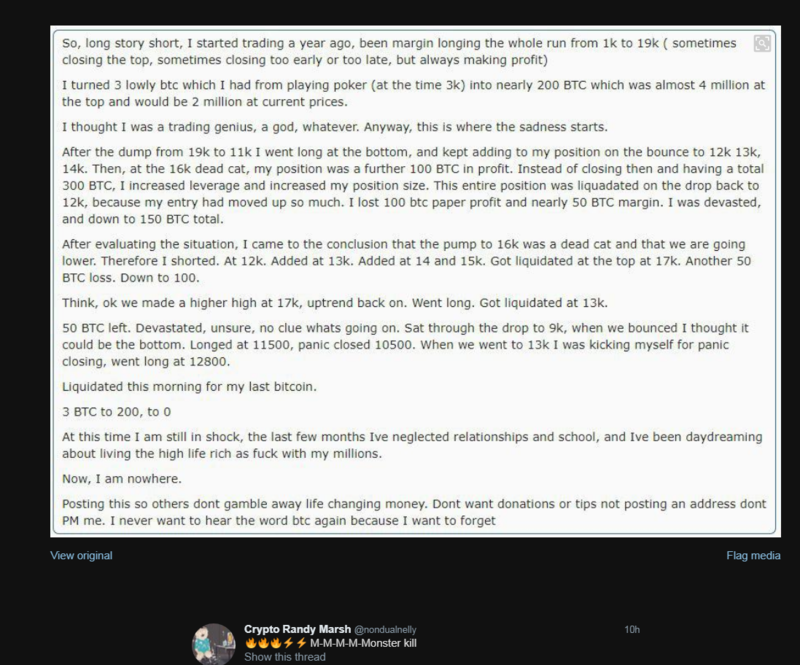 Summary of a bitcoin trader's experience over the last year. Hair-raising. Latest down swing attributed to reports South Korea to ban trading crypto from anonymous bank accounts. The report also repeats report of possible complete ban but it was reported last week that the chairman of the Trades Commission has ruled that out as being unrealistic as they lack the authority.